Blood Moon Redemption launches October 31, 2018. Publisher Ambassador International stated that this book is “gripping and memorable from start to finish”. It won Honorable Mention in Mystery/Suspense at the 2018 Florida Christian Writers Conference. It’s available for pre-order on Amazon. Throughout history, blood moons have always been surrounded by persecution and provision, great trials and triumphs. The first blood moons in 1493-1494 provided a new world for the Jewish people. The second in 1949-1950 gave them Israel, and the third in 1967-1969 presented the Jewish people with Jerusalem. Now, a fourth set of blood moons is on the horizon, and Tassie’s mother is certain they will bring about great change. Tassie, a young Jewish lawyer named for a lost religious relic, has her sights set on her career and love, and she doesn’t have time for silly children’s stories. Dismissing the blood moons as circumstance, her unbelief threatens to keep her from her destiny. When Tassie finds herself in the center of worldwide turmoil and a terrorist plot, can she accept her family history and fulfill her place in the future of Israel? Or will the country of her heritage finally fall to its many enemies? 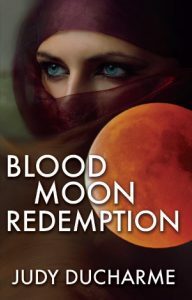 I had the privilege to read an advance copy of Judy DuCharme’s newest book, to be released in a few weeks, “Blood Moon Redemption” and – oh, goodness. It’s fiction and uses history, science, politics and intrigue with a healthy fill of faith and heritage to spin a fascinating story. I didn’t want to stop reading, and I wasn’t ready for it to be over when it was. The storyline itself is fascinating, and the characters are easy to keep up with but well-written and believable, not flat or one-dimensional. The main character’s life is dramatically changed thanks to a prophecy – about her – from over 500 years earlier. The story moves back and forth among different eras and generations as it lays out the chain of events. It was great fun, from the science to the history to the reminders of God’s dazzling, infinite and unfailing love. All of it. I recognized some people and thought I recognized others or at least their personalities or histories, that was fun. I felt refreshed in my faith, and am more eager to share it than ever. There were a few things that this book made me examine a little deeper than I have before, and it shed light on some things that I’d not thought about at all, just never on my radar… Have I used the words “fascinating” and “interesting” too many times? I realized again, for the millionth time, that though I’ve been in the church my whole life, others can always offer perspectives that I simply never thought about before and Blood Moon Redemption (need to remind you of the title, you’ll want to read it) was terrific. While the Bible makes it clear that no one knows the hour of Jesus’ return, it also gives us signs of His coming and tells us to be prepared. In “Blood Moon Redemption,” Judy DuCharme weaves together the biblical signs of the coming of Jesus with today’s news headlines to craft a page-turning tale of mystery and suspense. At the same time she delicately tells the story of a modern-day Jewish family grappling with the question of the Messiah, while interacting with Christians, Muslims, and Jews along the journey. With unexpected turns along the way, this story will surprise and delight, while inviting you to view today’s news headlines in a whole new light.